Do Brisbane Roar require a revolution? After two wildly successful seasons, watching their side drastically underachieve must be a strange feeling for Brisbane Roar fans. But with the benefit of hindsight, perhaps this wasn’t unexpected – Ange Postecoglou is a fine coach who must take the majority of the credit for transforming Brisbane’s fortunes, and in his absence, the squad has struggled to hit the heights of their dual championship winning seasons. Back in December, I discussed the problems at Brisbane in the immediate aftermath of Rado Vidosic’s ‘elevation’ to technical director, identifying seven key areas that have led to their poor performances. They were the coach, a loss of set patterns of play, more midfield freedom, Besart Berisha’s ineffectiveness as a false nine, the disappointing Ben Halloran, the loss of Sayed Mohamed Adnan and physical preparation, and without wanting to go over old ground; these have continued to plague the squad seven games into Mulvey’s tenure. The new coach has also identified another primary factor for the Roar’s decline – a lack of depth. With a few changes here and there, Postecoglou kept largely the same squad for his two year spell, and had a very obvious starting XI. In fact, Vidosic’s first choice side was barely indistinguishable from Postecoglou’s favoured team, but crucially, there was more depth within the latter’s squad, which gave him the opportunity to rotate tired players and change tactics from game to game. By contrast, Mulvey (and Vidosic) have had to rely on a group of fifteen players to carry the team, and there has been a clear focus in the transfer window on new recruitments. Stef Nijland could be that striker, although he prefers to play off another centre forwad, as a no.10. The 24 year old is a FC Groningen youth product and has endured a couple of disappointing years on loan to Willem II and NEC, and sees a change in climate and culture as the way to spark his flagging talent. 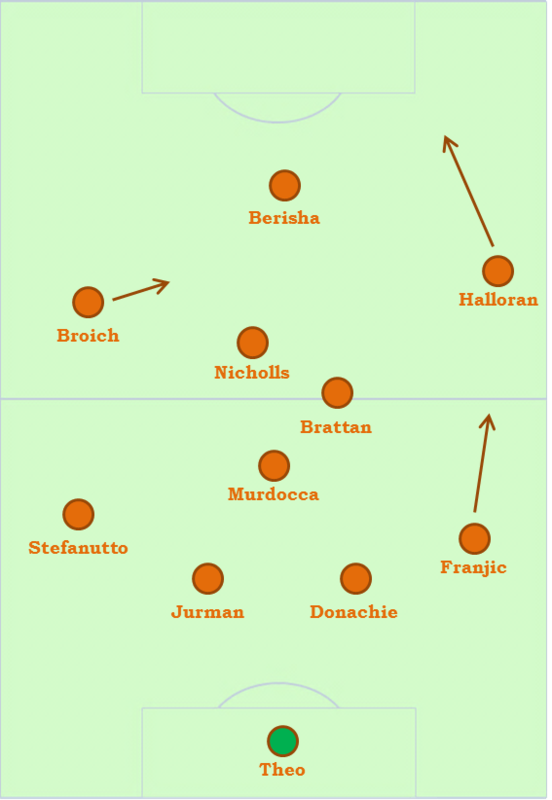 That suggests Mulvey might be considering using his two strikers in tandem – he might consider using Nijland slightly deeper behind Broich, but Mulvey has also experimented with Berisha in a wide left attacking role, where he darts inside quickly towards goal, and that in turn would allow Thomas Broich to play centrally, where he’s most effective. Meanwhile, Mulvey has also signed Jade North to bolster his defensive options, and although he looks likely to partner youngster James Donachie for his debut, long-term his partner will be captain Matt Smith. North was the first Indigenous player to captain the Socceroos and remains one of the more experienced figures in the frame for national selection with a fourteen year career spanning nine teams, where he established a reputation as a strong, clever defender possessing the crucial ability to play out from the back. That will be a refreshing change of pace from the ponderous Matt Jurman, who has failed to step up in the absence of Adnan both defensively and offensively. Significantly, North is highly versatile, able to play in any position across the defensive line, and although he will mainly be used in central defence, it’s possible he might cover at right-back with Jack Hingert out long-term, while North could also be an option to replace Erik Paartalu in midfield. That defensive midfield position is one of the key debates. Under Ange Postecoglou, Paartalu played the role expertly – splitting the two centre backs to form a deep triangle which helped play out from the back, then controlling the tempo of matches with calm, measured distribution from flank to flank, and helping break down deep defences with a sudden forward pass, as he discusses below. That ability to contribute in attack was central to Rado Vidosic’s desire to play a more open, fluid midfield triangle, but admist reports he’d taken his off the ball in favour of an overseas move, Paartalu played poorly. His passing became sloppy, his ball circulation was ponderous and he wasn’t contributing defensively. A move to Tianjin Teda, in reality, suited all parties. Paartalu doesn’t have a direct replacement in the squad, but Massimo Murdocca is probably the best compromise. He’s a typically precise passer, but the size difference between him and Paartalu is enormous, raising concerns about his physical suitability for the role. That probably influenced Mulvey’s decision to field Luke Brattan – whom Postecoglou called “one of the best passers I’ve ever seen” – in a deeper role, closer to Murdocca, where the English-born Australian helps raise the tempo with quick, accurate passes. (It’s a surprising development that Brisbane has begun to defend in two fluid banks of four, so their shape appears 4-4-2 at times, especially when Nijland partnered Berisha up front). “His time is now – he’s a very good accomplished player and has had bit parts to play in the past few seasons,” says Mulvey, and although his fitness is limited at present – he only lasted fifty-five minutes against Western Sydney, and his fatigue was against the Central Coast – he might become a key cog in the Brisbane machine. New loan signing Steve Lustica is another option in midfield – formerly of Gold Coast United, he brings energy and enthusiasm to the centre, but is good technically with a preference for balls over the top, and will likely be used as Murdocca’s ‘box-to-box’ replacement. Mitch Nicholls will play further forward in an advanced playmaker role, where he’s blossomed back into form after being marginalised in the Vidosic era. Broich could also play centrally, but is generally used either on the left and sometimes upfront as a false nine. Another concern is the side’s conditioning – as explained in the Vidosic aftermath article, they specifically geared their pre-season towards peaking for Asian Champions League commitments. But, as Massimo Murdocca explains, a reduced intensity now will result in an increase in the latter part of the season. This point is reiterated because it will come into play in the final rounds of the season – especially crucial, given the tightness of the table. There are quite clearly extenuating factors off the pitch that apply to Brisbane’s underwhelming season, but that said, there are clear problems with squad management and tactics that have contributed to their downfall. A particularly concerning development is that they’ve played more direct in recent weeks, with Theo often taking the option of a long punt downfield over a short pass – their ‘Barcelona’ identity, although exaggerated, created great tactical diversity in the league, and it would be a shame if it were forgotten. Above all, this greatest lesson for Brisbane this season has been in appreciating the impact Ange Postecoglou had on the club.